Local Bail Bondsman New York City: Can They Garnish My Wages? Can a Bail Bondsman Garnish My Wages? Never in a million years did you think you’d get such a phone call. One of your loved ones is in jail. Panic and uncertainty begin to settle in. After some time, you begin to collect your thoughts. Your first step is to call a local bail bondsman to get your friend or family member out of jail as quickly as possible. But as you do some quick research on posting bail, you come across an interesting topic: Can a bail bondsman garnish my wages for co-signing for someone? Read on as we answer that question and discuss how bail bonds work. Let’s first review how your local bail bondsman conducts business. He or she puts up your bail and you (the defendant) pay a fee for that service. As long as you don’t skip out on your court date, the bail money is returned. That said, if you don’t appear in court, the bondsman is forced to pay the amount in its entirety. This is where things can get a bit dicey on your end. Since bail bondsmen have the same legal rights as any other creditor, they may indeed choose to garnish your wages. Here’s what to expect with the wage garnishing process. For a small fee, the sheriff’s office serves the debtor’s employer with the writ of execution. By law, the employer is then bound to withhold and remit a portion of the debtor’s wages to the bail bonds company. It’s important to note that the garnishment process is not universal across all states. At ABC Bail Bonds in New York City, we require payment before posting a bond. 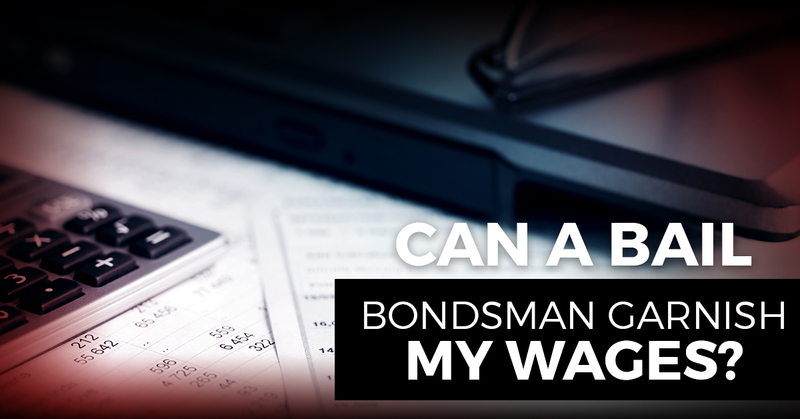 Our bondsman understands that the cost of the bond is more than a number of cash folks have on hand. That’s why we offer plenty of payment options and plans to help you or your family in an incredibly difficult time. For your convenience, our bail bonds agency accepts cash, cashier’s checks, and all major credit cards. We specialize in domestic violence bail bonds and DUI bail bonds, among others. In our 50-plus years of industry experience, we’ve seen defendants skip out on court appearances and put their loved ones in a less than ideal situation financially. That’s why we put such an emphasis on education. The reality is that few people understand the bail process and what’s at stake. Rest assured that the agents at ABC Bail Bonds are happy to answer any questions you may have. When it comes to 24/7 bail bonds, turn to ABC. Call now for an emergency bail bond.